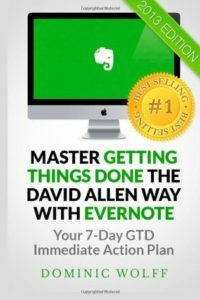 A ready-made plan to hit the ground running with David Allen’s Getting Things Done (GTD) system – using Evernote as the central “external brain”. Evernote is a highly flexible beast which means it can be so many things to many more people. I expect a system that works for someone else, has been tweaked over the years, and is ready to roll. Honestly? Not much. Wolff describes his version of GTD – which in a lot of ways doesn’t follow Allen’s. I’m coming fresh off the back having read the GTD bible – Allen’s own Getting Things Done book. While I’m by no means a GTD practitioner (yet) and my research shows everyone implements GTD their own way, if you say you are doing it “The David Allen Way”, you’d better be doing a faithful reproduction! The method Wolff describes seemed quite jarring and required a lot of tags – which in Evernote if you make a typo on a tag, you get a new tag. Was my Next Action tag ‘.na’, ‘na’, ‘.next’, ‘.nextaction’, do I use @ or # for context, so much to remember! GTD was supposed to make things easier! If you aren’t already an Evernote user, Wolff walks you through what Evernote is, what it looks like, and a bit of guidance on whether to choose the free or premium version (side note – I love Evernote anyway, you should go Premium!). He gets you through having Evernote installed (Mac, Windows, iOS, Android) and doing a basic setup that aligns with Wolff’s GTD implementation. The “7 Day GTD immediate action plan” starts on page 93. He assumes you’ve done the bulk of the work on the day BEFORE day 1 (day 0, must be a programmer!). Day 0 – Intro to “GTD” and setup of Evernote. The bulk of the book. The remaining sections of the book go into some “Advanced” Evernote usage. Web clipper, reminders, note links, integrations (IFTTT, smart notebooks, scanning) are all covered. Wolff is definitely an Evernote power user, but I would not use his work as the foundation for GTD. Evernote is awesome. Keep stuff in it. Find it again. This entry was posted in Learning & Reading and tagged Book Review, GTD by Will. Bookmark the permalink.